Close to a year and a half ago, I went from an iPhone to a Samsung Galaxy. My old phone was flaking out and the iPhone 5/impending-5S didn’t really do much for me. For the most part they were just very slightly larger than my phone and offered the same experience only a bit faster. So I picked up an Android phone with a speedy processor, LTE wireless, big screen, cool camera options, and the ability to tweak out the experience. I found that there was a learning curve but that I used many of the same apps that I did on my iPhone. The blog I wrote about the process argued that the “smart” in “smartphone” was largely the same for me either way because I used the same email, contact sync, cloud storage, notes, etc. on both devices. The ability of the Galaxy to tweak the experience and leverage a bigger screen was a plus for me so I went that route. What Galaxy is this Apple really from anyway? Fast forward to now and some things have changed a bit. My Samsung phone offered me a great experience. I got past the learning curve of how it worked and changed things up when I wanted. I used widgets, custom lock screen options, and got to be very efficient with it. It became my go-to device over my laptop and tablet – which are both Apple devices. Then something happened. It became hyper-confused about how to play sound over its speaker, Bluetooth, and earphones. I fixed it partially but there were times I had to reboot it during the day just to use the phone. Even resetting it didn’t fix the issue. There was no Samsung store to help and I even heard a few other stories of similar issues. It got to the point where I couldn’t rely on it for the core part of why I carry a phone with me. 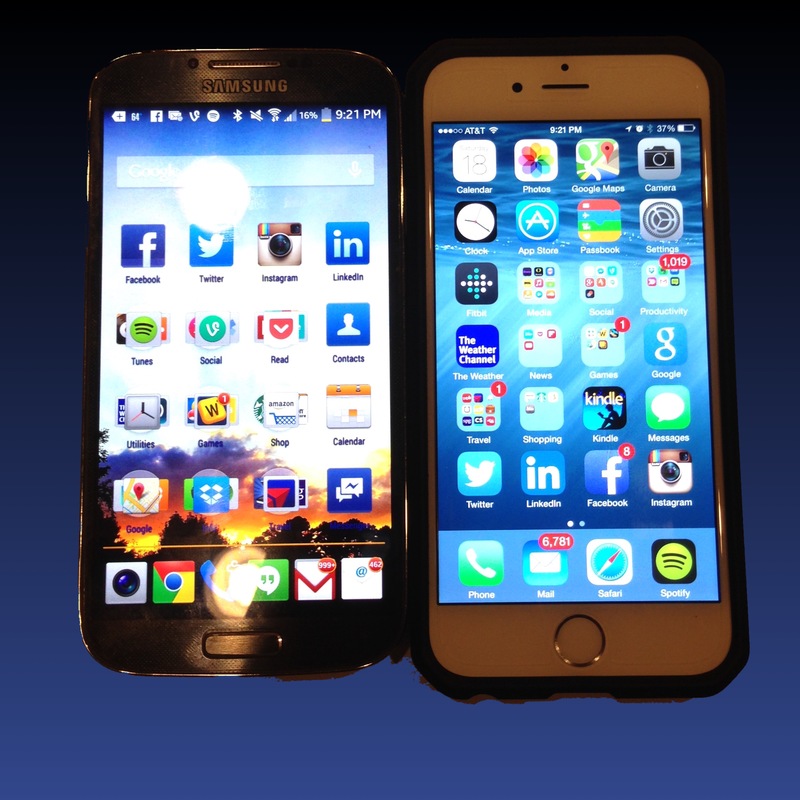 The iPhone 6 came out with iOS 8 and had essentially a philosophy change. The things I had learned to live with and love on the Galaxy were there for the most part. Sharing between apps is opening up. 3rd party keyboards are available – even the same one I used on Android. The screen size is essentially the same and even the lock button moved to the same place as my Galaxy’s. There also promised to be some concessions to widgets even though they’re not to the same extent as what Android offers. That was a something which continued to bite at me for a while – why all that screen space should just be used to house icons makes no sense. In short, Apple is starting to learn how to behave like the other guy even if not all the way. I bought a 6, not 6+, and had no learning curve at all. I reused my Apple ID and downloaded the same apps I had used on my old iPhone and Samsung. I set up my work and personal accounts with no issues. I put my media on it plus logged into Spotify and my social accounts. The entire process was almost underwhelming because it was so seamless. I noted in last year’s blog that I hedged my bets from either ecosystem and that means I’m really bound by neither. The iPhone’s got some advantages but I still miss a few things from the Galaxy. The experience is actually so similar at times that I catch myself in the UI trying to find something and realizing I’m on the other phone. My takeaways are that I was fairly on target last year. The “smart” is in how the device is used more than the device itself. Android devices tend to push the envelope more. Apple is about a year behind but offers (IMO) a smoother experience and some peace of mind should something like my wigged out Galaxy occur. The approach Apple is taking is making their products more seamless to use across devices and providing a very smooth experience once they bring capabilities to market. There’s going to be times where they seem hopelessly lagging and others where they nail the owner experience. Integrations between my iPhone, iPad, and MacBook Air are both cool and useful. The flip is true of Android. There’s enough manufacturers striving to differentiate that they have to provide more value at lower prices or features which aren’t found elsewhere. But at the same time, it may be a more fragile environment without a net and a steeper learning curve. Where the marvel happens is when you use the device on a daily basis to get done what you need to and the actual product is just a means to an end.